The Serial Command Language (SCL) or Streaming Command Language, as it is often called, provides a real time communication link to many of Applied Motion Products’ stepper and servo products. The commands that comprise the SCL command set allow for configuration, motion control, I/O control, and status queries over a network connection such as Ethernet or serial RS-232/422/485. Recently added SCL commands support new features and functionality on the StepSERVO and SV200 servo drive products. StepSERVO closed loop integrated motors with the Step-Servo Quick Tuner software and built in Q Programmer are well suited for labeling, packaging, and food & beverage applications. 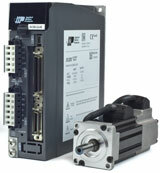 StepSERVO integrated motors provide closed loop servo control of position, velocity and torque using high torque step motors. The result is higher acceleration for faster machine cycles, and the motors run cooler and quieter than open loop stepper systems. StepSERVO integrated motors and Q programming are great for labeling, packaging, food and beverage applications. This Did You Know? article covers the process of closing a simple analog position loop using a Q program and an Applied Motion stepper drive with differential inputs. Some step motor applications require an operator to adjust a rotary valve or air vane and cannot use a homing sequence on power-up. The operator just needs to turn a control knob and have the load move to the correct location. 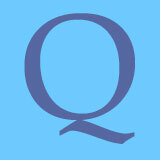 Many of our customers take advantage of the benefits of Q Programming, our text-based programming language designed for simple yet powerful programming of single axes. Q Programming incorporates commands for various kinds of motion, I/O control and sequencing, and math functions that enable users to create all kinds of motion control sequences and algorithms, from the most basic to very advanced. Q Programming is available on all stepper, servo and StepSERVO product lines. Did you know the same technology that drives the new Five-hundred-meter Aperature Spherical Telescope (FAST) in China is available to Applied Motion Products customers everywhere? Initiated in 1994, the FAST telescope is a key national scientific and technological infrastructure project in China. Standing in a region of typical Karst depressions in Guizhou province, the dish-like telescope will be as large as 30 football fields. That’s the answer to one of the more common questions we get at Applied Motion. We maintain inventory in our California warehouse as a commitment to zero lead time for our most popular set of step motors. The CORE step motors are the best choice to match with our drives and have been fully characterized with speed-torque curves with recommended drives. Speed-torque curves are important for every project because they are the most accurate representation of performance for a given motor and drive combination. Servo amplifiers need to be tuned to optimize performance for each application. This normally straightforward task can be complicated if the speed and torque requirements vary greatly during machine operation, for instance when there are distinct loaded and unloaded states. The SV200 Series Servo Drives provide a couple of useful options to resolve this dilemma. What’s the lead time for this product? Most popular hybrid step motors have a "step angle" of 1.8 degrees. The 1.8 refers to the angular distance between full steps and is a bit of an anachronism. 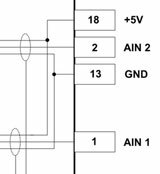 Most applications now employ microstepping to electronically divide the step size to as low as 51200 steps/revolution. Nonetheless, another class of hybrid motors exists that provide a full step size of 0.9 degrees. Learn about 0.9 degree step motors from industry experts at StepperGuru.com. In our last post, we showed that you can get more torque at higher speeds if you operate a motor at a higher voltage. In the example below, the red curve, measured at 70 VDC, provides much better high speed torque than the orange (12V) curve. So why not always use 70 volts? Better still, why not apply 100 volts and really flatten out that curve? Find out why step motors get hot and learn how to control temperature rise.